NordVPN is a fairly popular VPN service provider that supports many of the features that users come to expect from a service of its kind this day and age. It claims that it has a strict no logging policy, allows P2P traffic, offers servers in a lot of countries and regions, and does not restrict user bandwidth. The company released an add-on for the Firefox and Chrome web browsers which customers may install and use. 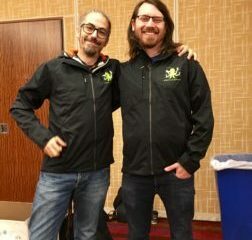 While one could argue that there is no need for a browser add-on if NordVPN is installed on the computer and running, there are cases were an add-on may be preferred by users. To name a few: you may not be able to install NordVPN in restricted environments, but may be able to use the browseradd-on. Using the extension gives you an option to connect to a different server, and even use some sort of double-connection to NordVPN if you are connected using the desktop program as well. NordVPN is compatible with Firefox 42 or later according to the extension’s profile page on the Mozilla website. It is fully compatible with recent stable versions of the web browser and should install fine as well when you run Firefox ESR. Chrome users can download and install the Chrome version of the extension for all supported versions of the browser. The extension adds an icon to the browser’s toolbar that you interact with. You need to sign in using your NordVPN username and password. Doing so can be a bit tricky if you copy and paste information, as the interface closes itself when the browser window loses focus. 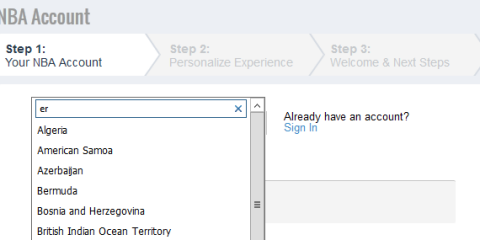 You may then select one of the available server locations to connect to. The connection process works well but the interface opened with a delay when I tested the extension in the most recent Firefox and Chrome stable versions. It took a second or two to open; now, I’m not sure if this was caused by another extension running in the browser or an app on the system, but it is definitely annoying even though you won’t open the interface a lot usually. The icon indicates the connection status, and you may configure the extension to connect to a server automatically on browser launch. WebRTC blocking — enabled by default. It prevents IP address leaks by WebRTC in the web browser. CyberSec — disabled by default. The feature protects against many forms of advertising, malware, phishing, DDOS attacks and other unwanted threats when enabled. I ran a series of leak tests and performance benchmarks. The extension protects the device IP address; leak tests picked up the VPN server IP address and not the actual IP address of the device. Benchmark returned good results for the most part; the performance of nearby servers was better usually than the performance of servers halfway across the world. Performance depends on a number of factors though including server location, the actual server, time of day, the computer’s Internet connection, the responsiveness and speed of servers you connect to, and more. 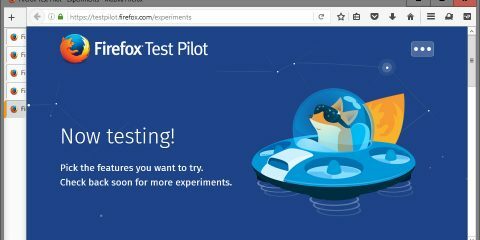 Reviews on the Firefox add-ons website indicate that the add-on causes connection issues. Several users reported connectivity issues to VPN servers after some time which stopped all Internet traffic in the browser. Only a reconnection helped to regain connectivity. I noticed this issue as well but not regularly (also in the NordVPN desktop client). 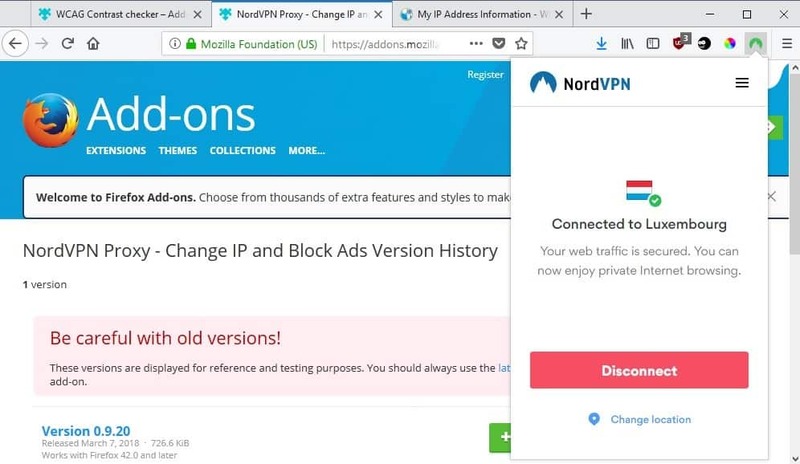 The NordVPN extension for Firefox and Chrome has some uses even if you connect to the VPN service using the desktop application that it provides. The extensions suffer from the connectivity issues that you may experience while you run it but it is unclear how widespread the issue really is. The browser extensions offer similar functionality but development is not synchronous. The Chrome version’s last update date is listed as February 15, 2018, the last update date for the Firefox extension is listed as March 7, 2018. Now you: Do you use a VPN network? Ghacks needs you. You can find out how to support us here or support the site directly by becoming a Patreon. 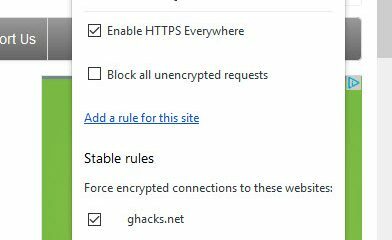 Thank you for being a Ghacks reader. The post A look at NordVPN’s browser extensions appeared first on gHacks Technology News.